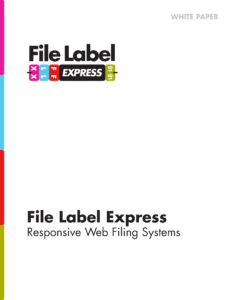 File Label Express is built on state of the art, web standard technology that is widely used in every office. It can be deployed with the click of a mouse or with a tap on your Android or iOS device. We are custom file labels and comprehensive filing strategy. There are no complicated requirements or configurations. Simply choose a label design from our standard library. The application is delivered independent of your operating system or platform, right in your modern web browser. File Label Express renders labels in PDF format for easy, high-quality printing. Get Acrobat Reader. If you have your own labels or design requirements, contact us. Contact us if you need to outsource your label printing. Upgrade your account to store and track data on your files, including with a handheld RFID device. File Label Express uses industry standard encryption and security methods. Download our whitepaper to learn all the benefits of using File Label Express.